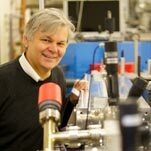 A Physics professor at Strathclyde University has been named a Fellow of the Royal Society of Edinburgh (RSE) in recognition of his work in lasers and plasmas. Professor Dino Jaroszynski is one of the 56 new fellows to join the RSE in its work to promote the advancement of learning in Scotland. Professor Jaroszynski main focus is in lasers and plasmas and has developed rays which can potentially be used in areas including medical imaging, radiotherapy and monitoring the integrity of nuclear waste. He has also conducted research which could make vast and expensive techonology more affordable and compact enough to fit in a room. Professor Jaroszynski said: “It is a great honour to be recognised by my peers in a Fellowship of the RSE and to join the many Strathclyde colleagues who have also received this accolade. RSE President Professor Dame Jocelyn Bell Burnell said: “I am delighted to welcome such a wide range of outstanding individuals to the Fellowship. Each of our new Fellows is elected on the distinguished merit of their work. Professor Jaroszynski’s work is the subject of a major investment by the University and the Scottish Funding Council that has recently led to the completion of a new extension to the Physics Department where essential research will take place in a wide range of subjects. Physics research at the University placed first in the UK in the 2014 Research Excellence Framework (REF), with 96% of research deemed as world-leading or internationally excellent. The new intake of RSE Fellows also includes National Theatre of Scotland Chair and former Glasgow School of Art Director Dame Seona Reid, who gained a degree in Sociology at Strathclyde and was awarded an honorary degree by the University in 2009.